Honolulu, Waikiki, Kauai, Kona…all these exotic names of places you can only dream of visiting give an onomatopoeic sound of a pebble skipping on the water’s surface when you utter them. Well, stop with the phonetic activity and start packing your bridal trousseau, because there’s no place quite as exciting to exchange vows with your beloved as in this sun-kissed, tropical, yet very American state! Sopranos star James Gandolfini married former fashion model Deborah Lin in Honolulu, and had 200 guests witnessing the romantic “I do’s” uttered between the two. Plenty of white flowers and leis around pretty, elegant necks provided the perfect Hawaiian wedding touches, but the sky meeting sea in a clear, opulent blue was what made the whole event uniquely memorable. James and Deborah, as well as other adventurous celebrity couples, certainly chose the perfect first step to spending their lives and love together in sunny, sandy Hawaii. Contrary to popular belief, the islands of Hawaii aren’t just perfect for beach wedding receptions complete with hula dancers and a mouth-watering luau (though there’s plenty of that, if that’s how you prefer your wedding). Nowadays, the internet is rife with wedding planner sites that specialize in Hawaiian weddings, and most promise to handle everything for the engaged couple: from helping them choose the type of wedding ceremony, to assisting in obtaining a marriage license, through to accommodations and nuptial details consultation. Wedding packages abound, and there’s no doubt something will fit your budget if you just look hard enough. Bear in mind, however, that this dime-a-dozen phenomenon doesn’t necessarily guarantee a hitch-free ceremony without you having to lift a finger. If you personally know people who’ve taken advantage of a Hawaiian wedding organizer with nothing but praises for the service, then go ahead and use the same. Otherwise, if you’re going to be relying on choosing online alone, comb the sites for testimonies from satisfied customers, see if they’re part of such organizations as the Better Business Bureau, and look more closely at all the details that make their services a cut above the rest. Then be as obsessive-compulsive about it if you must. It is your wedding, after all, and having a wedding organizer work to make everything tailor-made to your preferences is only reasonable. 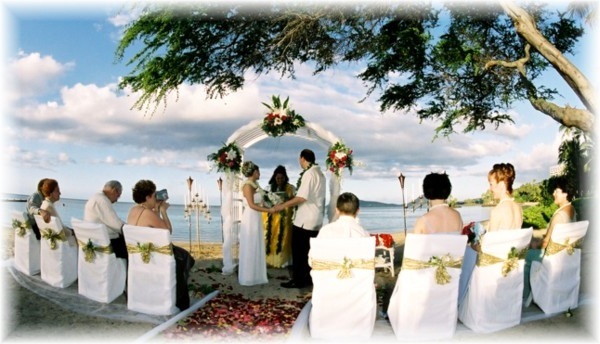 Some wedding packages even provide local assistance, so if your budget permits a pre-nuptial trip to Hawaii (which is a must, actually) to consult with the movers and shakers of your wedding, then no ifs and buts about it: book that flight. Things are relatively simple on the wedding license front because everything is still covered by American nuptial laws, so you can just concentrate on the nitty-gritty of your special day like the catering, photography, music, accommodations, and of course, the location. Meet with the minister or officiating priest, sample the food, dip your toes in the waters of the beach of your choice…just make sure you spend some time in Hawaii and soak in the local colours. That way, when your big day comes, it won’t be just another wedding location you chose randomly, but one that will hold a special, tropical meaning for you and your spouse in the coming years of wedded bliss.